Brickfields has a mixed population of mainly working class people. It has many social ills typical of a large city such as drugs, street violence, drunkenness, destitution and homelessness. The Lions Club of KL Bukit Kiara has a street feeding project in Brickfields from Monday to Friday. 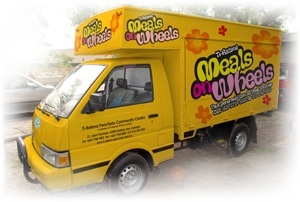 Meals on Wheels have been supporting The Lions Club of KL Bukit Kiara for the past few months since 2011 to supply 90 packets of food fortnightly Monday/Friday of the month. If you wish to contribute please consider giving it to all 90 recipients. Please be advised to dress humbly.